The LvH – a friendly yet insanely competitive new trophy that was up for grabs for the first time from the 23-25th July. Racing from the Manhattan Yacht Club on the waters edge of Jersey City, the LvH stands for Luigi (Galbiati) verse Howard (Spencer), a challenge that was initiated and accepted after Menace Yachting / Royal Akarana Yacht Club won the 2017 International Yacht Club Challenge in New York. For the first time in about four years, the weather wasn’t playing ball for sailing. Luigi said “it’s never like it, and I just can’t believe it!” The forecast for day one was rain and wind gusts of 30 knots – less than ideal sailing condition for an International One Design, and for a team (the Kiwis) who had never sailed that class of boat. Eventually the two skippers called time on day one, with the goal to try again for the second day of racing. The match racing event was to be scored a little differently than traditional races. One point per win was up for grabs on day one, two points per win for day two and three points per win for day three. Day two was also welcomed with less than savoury conditions for IOD racing, and before letting the day go by without a race, the decision to call it early was made, with Luigi and his team showing off New York to the Kiwis. Day three and it was all go. The conditions had semi-settled so it was time to get on the race course. Luigi Galbiati, Taylor Canfield, Mike Buckley, Malcolm Forbes, Elliott Wislar, Michael Verost and Matt Winalski with Mike Buckley and Adam Sandberg who were due to race on the first and second days. Needless to say, these sailors need no introduction. The Kiwis took an early lead rounding the first mark 31 seconds clear of USA. USA received a penalty after hitting a mark with their boom while on the downwind. Both teams went left upwind for the second time but the Kiwis took more out of them time, now 60 seconds ahead. But they managed to twist their spinnaker on the second downwind, wrapping it nicely around their forestay, but managed to get things cleaned up shortly before the finish. USA faced some downwind hurdles with their spinnaker as well, but quickly fixed it – however it wasn’t enough. 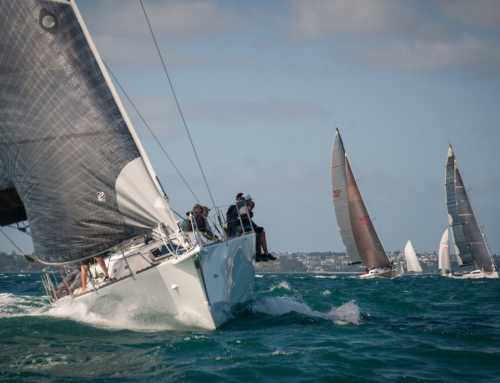 The Kiwis were once again in the lead at the top mark, but this time by just 16 seconds. USA caught up and narrowed the gap slightly gaining two seconds by the bottom mark. Upwind for the second and final time USA went right and the Kiwis went left – with the latter paying out the most. The Kiwis increased their lead to 31 seconds. The wind increased for the final race and both teams elected not to use spinnakers. USA switched out their helmsman to try to get an upper hand. This time it was Elliot Wislar who steered their team. But it wasn’t enough. The Kiwis carried a 30 second lead for the entire race, putting them over the line in first for the third and final time. 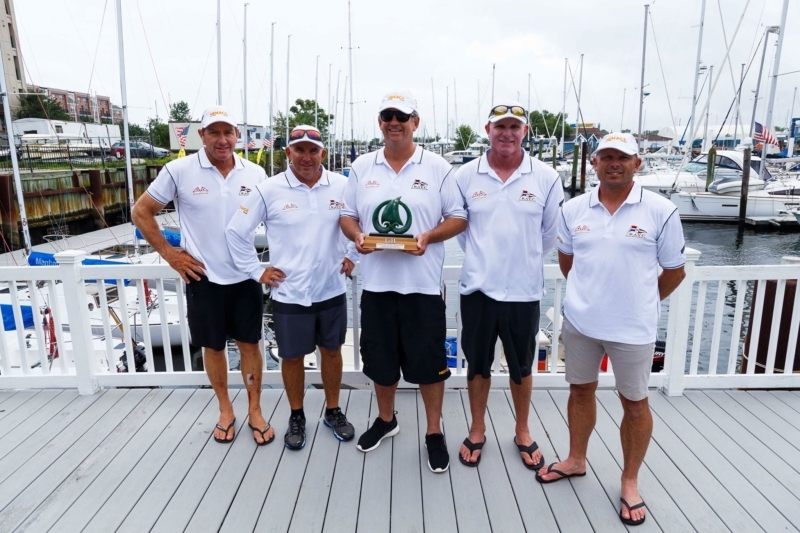 Based on those three races, New Zealand made a clean sweep of the inaugural LvH, with the custom designed greenstone trophy heading back to Kiwi shores to live at the Royal Akarana Yacht Club until the two teams meet again. 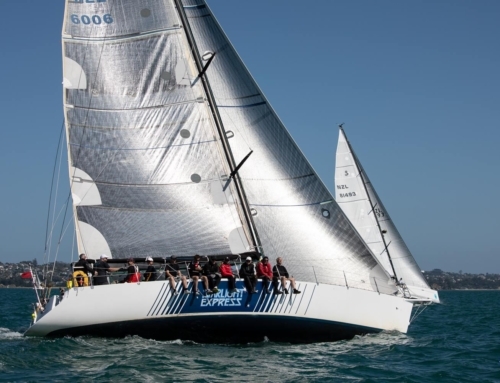 The challenge has been cast for a face off in 2019, this time in the M-Class on the Waitemata Harbour. The LVH in NYC was a great regatta. We achieved the goals that we set out in LVH deed of gift. A serious regatta with the ideas of building friendships. We were up against some top sailors, Mike Buckley and Taylor Canfield. It was really good to see Luigi taking the event seriously bringing these guys in and we had a really good time hanging out over the three days. Unfortunately the first two days were blown out but it did give both teams ample time to build friendships. When racing kicked of we were in top end conditions for the boats which created exciting racing, we had a couple of hairy death rolls downwind and Team Luigi had a man overboard situation. The final race was without kites which was a huge relief to our bowman James Dagg, fresh from his win at the TP52 Worlds with Quantum Racing. It was great to have Paul the umpire who flew in from San Francisco and the local race committee ran smooth races,” said Davies. The spirit of the past few days is why most pick up sailing; the love for the elements and the camaraderie. The weather gods gave us a chance to work on the latter; which our teams seized in a grandiose fashion. They then allowed for a small window to race, and our Kiwi friends taught us a thing or two! Bravo & till the next one! 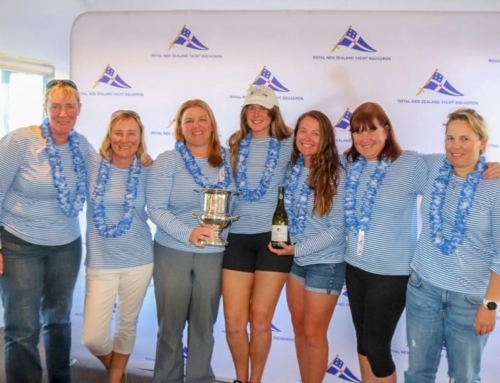 Congratulations to both teams on a great regatta but most importantly, for bringing the Royal Akarana Yacht Club and Manhattan Yacht Club together for years to come. Special thanks to Live Sail Die New York photographer Rod Harris for capturing the moments.